My friend Joel requested that I put in an additional label to his new motorcycle styled jacket that I just made him. He wanted a vintage picture of yours truly in gear. 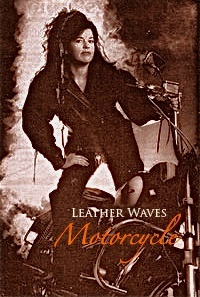 This is one of my favorites from the late 80’s taken by Buddy R.-at that time a much sought after photographer who made pictures for all the big bike magazines…I remember riding my bike into his studio, he was awesome and with his stylist and make-up artist made me into quite the biker babe! This picture was eventually made into an ad for the then very-hip magazine called LA style, and actually went on to win an award from LA County Municipal Art Gallery for that year, in the catagory of Best Advertising Art. Wow, that was a coup! Back to the present…Joel was thrilled with the new label, then Jeff wanted one, so now it’s become an offical and additional label in all my motorcycle jackets. Cool, right? !